The ingredients necessary to ferment tea into Kombucha are very basic - water, sugar, and tea. I figured that sun brewed tea would work just as well as tea made in the traditional manner and I was right! 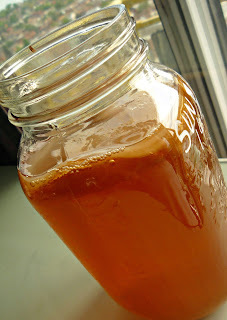 I made a regular sun brewed tea (water and tea bags in the sun), then I sweetened it with a simple syrup and threw in a SCOBY. This kombucha is light and refreshing with delicate citrus notes. I drank this tea after only eight days of fermentation and I found it to be perfect - it's still sweet and refreshing. Future experiment: Sun Brewed Kombucha made into a Sangria beverage!